New York, USA -- The Rubin Museum is not familiar to many people. It is located in the building formerly occupied by Barney?s on 17th Street at Seventh Avenue. Its artistic mission is to show art from the Himalayan region. Built around a fantastic collection of primarily Tibetan art, the museums? changing exhibitions explore the sources, themes and ramification of Tibetan?read Buddhist?art. So what was once a kind of temple of retail opportunity is now a kind of temple of spiritual opportunity. Anyone who has seen Tibetan painting knows of its dynamic symmetry, wildly contrasting colors and wealth of symbols, signs and general combination of fury and serenity. That sounds like a mouthful but the experience is more like a mindful. One of the current exhibitions at the Rubin focuses on the use of handprints and footprints in Asian painting and sculpture. The appearance of footprints in Buddhist art is a tradition that began in northern India based on relics or evidence of the historical Buddha and his teachings. 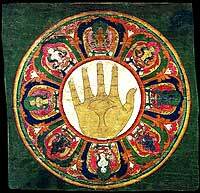 Called Buddhapada, the use of the prints changed and spread to Tibet and eventually most of the rest of Buddhist Asia. The show includes work from China, Sri Lanka, Burma, Japan and elsewhere. The intentions and uses of these paintings are many; some are objects of worship themselves. Others are meditation aides or historical paintings. The appearance of handprints spread and changed in a similar fashion. One of the most beautiful segments of the show is a group of paintings that include hand and footprints accompanied by deities, lamas, saints (Bodhisattvas), Buddhas, landscapes and more. The color is dazzling; if you?re completely unfamiliar with Buddhist thought this show should inspire you to find out more. Even those not disposed to spiritual paths can benefit. For us New Yorkers, the work acts as a reminder of the infinite compassion and love at the root of Buddhist thought. The Rubin Museum is cool and beautiful. A visit is an enriching way to spend some time.